Yes, I know, it’s just a ball of wool. In fact, as you can probably tell, it’s wool that’s been knit and then unknit. This is what I get for knitting while watching Lost. Just two nights ago, this was an almost-completed Basic Rolled-Brim Hat in the child’s size (the same pattern I used for this hat). Note the word basic in the name. I like to have an easy knitting project around for doing while I watch TV, and this pattern is easy. Most of it is just plain knitting, round and round and round. The decreases require a little more attention but I use stitch markers after each one, so they’re usually a piece of cake. This time, though, when I did the first row of decreases, I realized that I was one stitch short. I hadn’t dropped one, so I must have counted wrong when I cast on. That wasn’t too much of a problem—I just fudged it. No one would notice if one of the decrease ridges started a row late, except perhaps for a rather tall person peering down at the wearer’s head. Then a few rows later, I found that I was two stitches short. Despite my careful (I thought) use of stitch markers, I’d obviously miscounted again. Figuring that the problem had to be in this row, since the previous decrease row had been fine, I took it out and re-knit it, only to find that those two stitches had not miraculously turned up. Since this is a small project, I decided to just rip it out and start again, rather than risk making it even worse with my sudden lack of math skills. Now, my husband and I started watching Lost only recently, after my cousin raved about it. We’ve started at the beginning of the first season, borrowing the DVDs from the library. The show—at least the episodes we’ve seen—is very intense and obviously I shouldn’t be knitting under its influence. I’d already noticed that my knitting got tighter during the scary parts and now I’ve discovered that I’m apparently incapable of counting to eight while watching it. As I tell my friend Hayley so often that I’m sure she’d be happy to stuff this ball of wool into my mouth like a plug, there’s always a bright side. This is the first time I’ve used this wool (Patons Classic Merino), and it’s nice to work with—now I get to spend even more hours with it. Dong some blog walking today, walked over from 25 Things for Charity. Patons is nice yarn. I love your logic as well! I know what you mean about projects you can do in front of the TV. I have so many patterns I like the look of, but often end up doing my own thing...simply because I'm knitting and or crocheting someplace where I can't tote a pattern, a counter, and pay attention to what I'm doing. 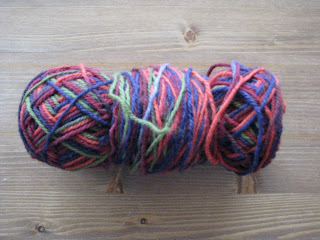 I've also decided sometimes the yarn is so nice/ variety of colors etc. that you don't need complicated patterns to make it cool. At least thats my rationalzations. Hope you have a good wkend. Stop in for a visit, the welcome mats always out.